It is very difficult, as in many countries, to obtain reliable information about military aviation in Iran. During the Imperial era most information has come from outside sources, particularly the USA. There are slight differences, according to source, regarding the exact number of Freedom Fighters supplied. All datas given in this section are unofficial, details written in blue without underline are not confirmed. In the early 1960's Iran was part of the Central Treaty Pact (CENTO) defence pact, together with Turkey, Pakistan and the United Kingdom and sponsored, as main arms supplier, by the USA. The fighter force of the Imperial Iranian AF (IIAF) consisted in 2 Squadrons equipped with Republic F-84G of the 1st Fighter Wing at Mehrabad AB, and 2 Squadrons of North American F-86F based at Dezful-Vahdati AB (35 overhauled out of 51 delivered). At the time the Shah Reza Pahlevi, chief of state and commander of the Air Force, ordered a rapid development of the air arm to establish air supremacy over its neighbouring Arab countries, particularly Iraq. Iran was also looking with concern to the Soviet Union power. 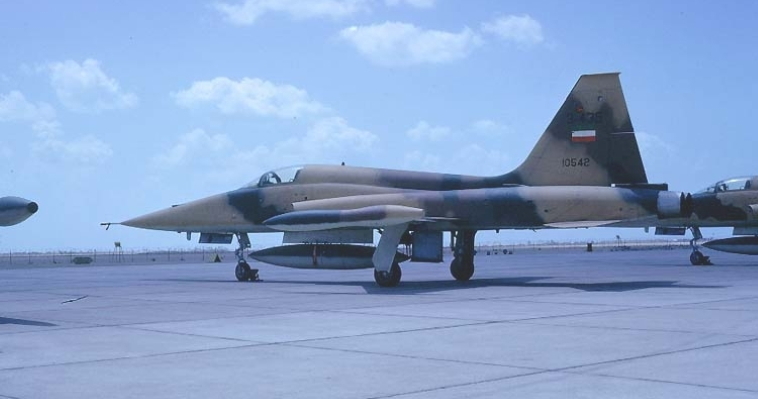 During a meeting on 19-09-62 about Imperial Iranian Armed Forces requirements between the Shah and the US ambassador it was agreed that eight Squadrons of Northrop F-5 would be enough to cover the Air Force's new needs. Later agreement covered 91 Freedom Fighters for 7 Squadrons of 13 aircrafts each; the initial two batches were supplied through Military Assistance Program (MAP) free of charge under the code Projet "Peace Enforcer" but the following aircrafts were paid by Iran under Foreign Military Sales agreement. An official US source mentions 92 aircraft, might include a replacement aircraft for one lost during delivery. The Shah of Persia was briefed about the capabilities regarding the Northrop YF-5A in June 64, during a visit in USA. The IIAF became the first Air Force to receive Freedom Fighters; first Northrop F-5As were handed over on 04-12-64 in USA at Brookley AFB (Alabama, USA), 11 Northrop F-5A and 2 Northrop F-5B arriving in 01-02-65 at Tehran-Mehrabad AB to equip the 21st Tactical Fighter Training Squadron at Mehrabad AB, the unit being already partially operational in June 1965 after 900 flying hours. Re-equipment of the second unit, as well as the two Squadrons at the Tactical Air Base 4 Vadhdati AB, followed later. Initial group of instructors were trained at Williams AFB in 1964; new pilots obtained their advanced training in USA on Northrop T-38As, transitioning to Northrop F-5B at Mehrabad AB, checked out by USAF pilots of the locally based Mobile Training Team; technical personnel was sent to various USAF schools. The Team remained at least until 1976, teaching also for the Northrop F-5E. Camouflaged F-5A 97109 in USA on 10-06-70, before delivery. 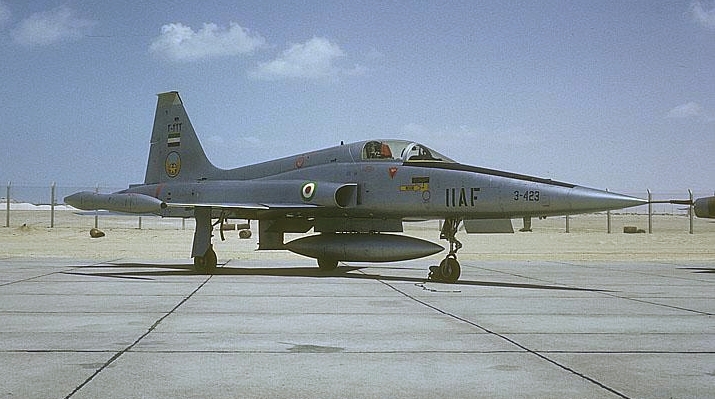 Deliveries followed at a high tempo, the Air Force commander General Khatami stating in July 1967 that there were four F-5 Squadrons, while US sources mentioned only 3 Squadrons, one of these being 302nd Fighter Squadron; around 40 F-5A and F-5B (34 single-seaters) were known to have been handed over at this time. Serviceability was high: 85 to 90 percent. The Military Assistance Program had ended with US Fiscal Year 1963 due to the high rate of economic growth; by 1969 additional 26 additional F-5s had been bought through the Foreign Military Sales Program (FMS, direct payment), later reaching a total of 48 during following US Fiscal Years: 1967 - 4, 1968 - 25, 1969 - 4, 1970 - 15. Total procurement was 107 Northrop F-5A, 13 Northrop RF-5A and 20 Northrop F-5B. According to "acig org" Iran actually received a total of 20 RF-5A starting 1968; initially 12, followed by 6 with serials "blacked out" in the production list and later by 2 "white tail" F-5As modified for the reconnaissance role. Actually, there are 4 FY 67 serials that follow the 13 known ones officially as a cancelled Foreign Military Sales order. See "operations" chapter for details. In March 1966 Sharohikh AB (TFB.3), established in June 1965, was hosted the 301st and 302nd Tactical Fighter Squadron, joined as of 1969 by the 303rd TFS. Each unit possessed 13 Northrop F-5A/F-5B; they were re-designated (possibly in December 1971) 31st and 32nd TFS upon re-eqipment to McDonnell F-4E (completed in 1972), delivery starting in 1971. The 303rd TFS replaced the Freedom Fighter with McDonnell F-4E between 1973 and 1975. By November 1970 105 F-5A/Bs had been delivered; they were in service with 5 Squadrons, together with 2 McDonnell F-4D Squadrons equipped and 1 North American F-86F Squadron. Delivery of F-5A was completed by January 1971. According to official US sources there were 111 F-5 in use in 1972; Northrop had 6 technical representative in Iran. Squadrons had originally three digits, changed in 1971 to two digits, the first one being the number of the Air Base where it was based. 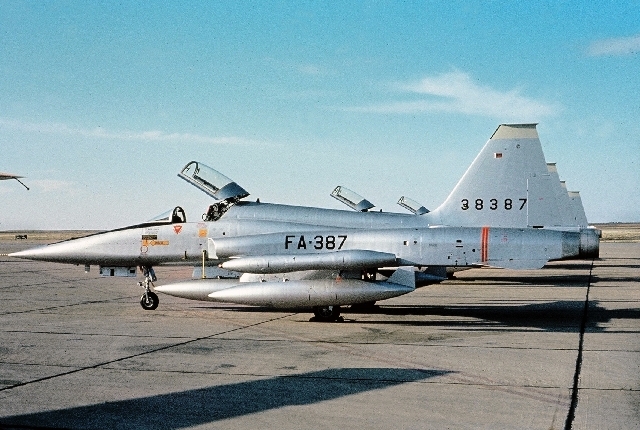 In October 1972 an urgent request was made by the US Ambassador in Teheran for the transfer of all F-5s (53 MAP supplied, 37 directly bought) to the Republic of Vietnam AF under the US Enhance Plus program. The Shah initially opposed, mentioning that this would weaken the defence of the country overproportionally, but finally agreed to supply 32 Northrop F-5A in two lots of 16. Disassembly of the first 16 was completed by 02-11-72 and tranfer to S Vietnam on Lockheed C-5A Galaxy began. Eight USAF McDonnel F-4Es were initially leased to overcome the gap in Iranian defence. Iran was not interested in the return of the F-5As; value of transferred aircrafts (11,6m USD - 28 being 5 to 8 years old and 4 three to five years according to US calculation) was to be credited against the purchase of new McDonnell F-4Es. According to an official US list funding was provided for the Security Assistance Program FY 1976 (or previously) 38 Northrop RF-5A, 10 F-5B. Between 1968 and 1975 an enormous effort was made to build radar facilities and 7 new bases to house all new aircrafts ordered (inclusive McDonnell F-4 transports and helicopters), as at the time there were only 3 fighter bases available: Teheran/Mehrabad, Dezful/Vahdati and Hamadan/Shahroki. Of relevance to us is was Chah Bahar AB, opened in 1973, housing one Squadron of F-5 and one Squadron of McDonnell F-4E; the base is mainly underground and assured the defence of the narrow Strait of Hormuz, the only sea passage for petroleum exporting Persian Gulf states. In October 1966 No 17 Squadron, Pakistan Air Force, Canadair F-86E Mk6's came for 10 days to Teheran to take part in the Air Force Day flly-past. Iranian training included visiting neighbouring countries; Sharjah was visited on 31-03-67 by 14 F-5As (6 silver, 8 camouflaged) and 1 camouflaged F-5B of the 302nd Fighter Squadron, supported by 3 Lockheed C-130H of the 50th Transport Squadron. A detachment of RF-5As were detached to Mehrabad AFB, Tabriz AFB, Vahdati AFB, Shiraz, possibly four each. According "acig org" RF-5As were active above the USSR skies in top secret missions; 2 were shot down in 1969 and 1970. A number of unpublicized encounters with Iraqi MiG-21s have also taken place along the Zagros mountains border (North-Western Iran) at least up to 1970 without any combat action, aircraft remaining on their respective border side. Two joint aerial combat excercises with the Pakistani AF had also been conducted by 1970; the first one (date not known) consisted in 4 F-5As and 1 F-5B flying against North American F-86F, the second one in F-5As and F-4Ds operating against Shenyang F-6s (Mig-19). 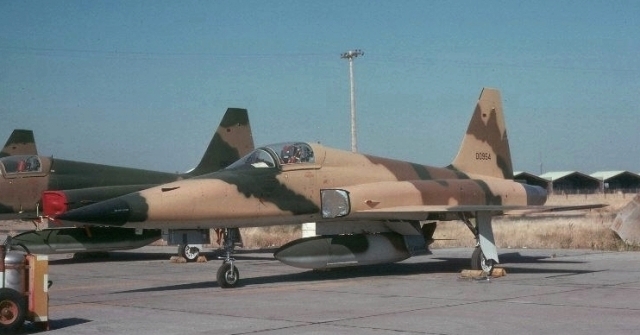 It is not confirmed if F-5As were sent to Oman to fight uprising in the Dhofar region, as it seems that only McDonnel F-4Ds were transferred to Thumrayt AB in January 1973 attacking targets on the ground, making reconnaissance flights and patrolling the border to the People's Republic of Yemen. Acccording to an unconfirmed information 1 aircraft was shot down during a border patrol in December 1976. Iranian engagement in Oman ended mid 1977. The Iranian aerobatic team was named "Le Sabre" and based at Teheran-Mehrabad AB till 1967, equipped with 5 North American F-86F; it was renamed "Golden Crown" in 1968 upon its re-equipment with 5 Northrop F-5A, reverting to the original name and F-86F in the years 1969 (6) and 1970 (5). The team was renamed "Golden Crown" in 1971, equipped with 6 F-5As, but flying only 5 aircrafts in 1972 and 6 from 1973 to 1975. In 1976 it transitioned to Northrop F-5E. The year 1967 saw the first accidents, after 2 accidents free years ; three F-5s were lost in the first seven months, 1 during a ferry flight (delivery?) from Athens, another two during low-level gunnery training. Later known losses are: one F-5 in 1971, and one during the same year, as well as one in 1974, by the Golden Crown team. Freedom Fighter day-to-day maintenance was initially provided by the Air Force at Teheran-Mehrabad AF, the largest local maintenance basis, but, with the increasing number of aircrafts, a new structure had to be established. Iran Aircraft Industries (IACI) was formed as a joint venture with Northrop Corp. in 1970; by December 1970 it performed 400, 800 and 1'200 hours inspections, heavy maintenance and overhaul of the Northrop F-5s, their General Electric J-85 engines and built spare parts. Twenty five Freedom Fighters had undergone ovehaul by 1973, when a new, very large facility was under construction at Mehrabad airport for the purpose of overhauling aircrafts, building spare parts and training technicians locally. All work was F-5s was done by locally trained Iranian personnel. Development of a later F-5 version, the Northrop F-5 Tiger, was of great interest to the Shah; 32 Northrop F-5E single-seaters (later 36) were bought under FMS in February 1972 under the Peace Rush I programm. Original US plan was to send one Northrop instructor pilot to Williams AFB for test and training in March 1973 to be ready to be transferred to Iran ca. June 1973. On the Iranian side 2 highly qualified Northrop F-5A/F-5B pilots were to be sent mid-May to Williamas AFB for Tiger conversion training lasting ca. 2,5 months. Foreseen scheduled delivery was to be as follows: first 2 Iranian aircrafts (1 in June, 1 in July 1973) to Williams AFB for training above pilots, transferred to Iran in October together with the pilots. Further deliveries to Iran would follow in 1973 and 1974: 1 in July, 2 in August, 2 in September, 2 in Otober (plus 2 ex Williams AFB), 2 in November, 3 in December; 6 in January, 7 in February, 5 in March.An additional contract for 105 followed in July 1972 and 28 Northrop F-5F double-seaters were ordered in 1973, totalling 141 F-5E (at a cost of USD 377 millions) and 28 F-5F (at a cost of USD 102 millions) to replace on a one-to-one basis Freedom Fighters in 8 Squadrons plus an high number of reserve/attrition replacement planes and some test and training ones. Main foreseen role of the Squadrons was air to ground support, air-defence as secondary role. A very large number of spare parts were also bought to keep the fleet operational for several years without US support, something that came to good in later years. Another acquisition of 36 Northrop F-5E for two additional Squadrons was contemporaneously cancelled; funds were transferred to the purchase of Grumman F-14s. The single-seater Tigers were highly improved aircrafts over the basic version, with an onboard Litton inertial navigation system, weapons/ballistic computer and rocket assisted Martin-Baker ejection seats; double-seaters had TACAN/INS laser target designator and Northrop Improved ECS additionally. Fast delivery of the aircrafts was essential, due to the transfer of Northrop F-5As to South Vietnam and the delivery of additional 25 MiG-21 to Iraq. 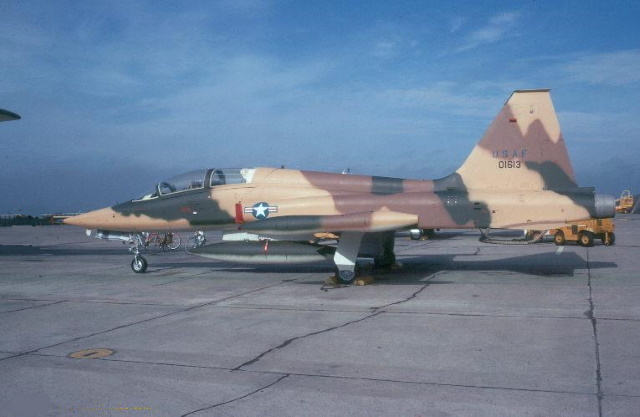 Foreseen delivery schedule was 11 by March 1974, 32 by by October 1974, but aircrafts originally planned for USAF instructors training and delivery to South Vietnam were redirected to Iran to enable replacement of the 32 F-5As transferred. Two Freedom Fighter instructors were sent to Williams AFB's 425th Squadron for an approximately two and half months conversion to the new fighter; USAF Instructor pilots were detached to Vahdati AB with the technical Assistance Field Team. 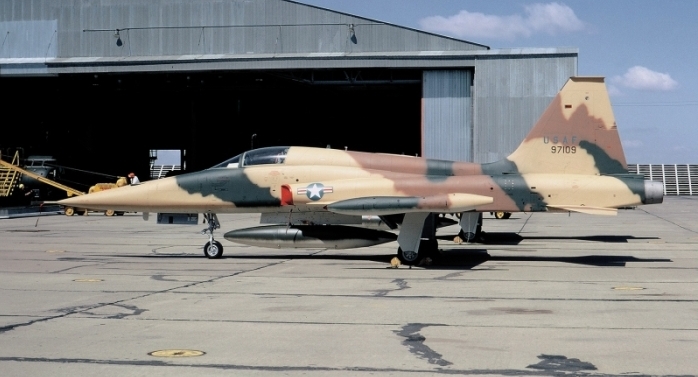 First Northrop F-5E came off the assembly lines in November 1973; the USAF accepted two Tigers on behalf ot the IIAF in January 1974, followed by 5 additional ones in February 1974. Air transfer to Iran started in February 1974, staging through Lossiemouth (Scotland), but, after the loss of one aircraft, six-pack delivery on board Lockheed C-5A Galaxy was resumed after July 1974. 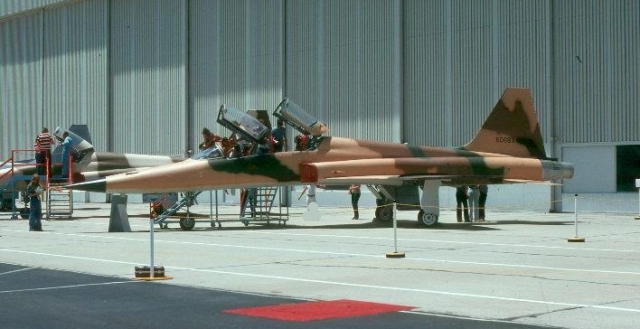 First flight of an Iranian Northrop F-5F two-seater was at Palmdale in April 1976; delivery started in June 1976; contemporanously Iran ordered of 1066 AIM-9P-1 air-to-missiles to equip both the Tigers and the F-4E Phantoms. Delivery of the single-seater Tigers was completed by end 1976, approximately 20 F-5F being received by then. By 1977 all Tiger units were operational; average operational availability was 90%, over 500 pilots and 1'500 maintenance personnel had been trained. Remaining Freedom Fighters were mainly put at disposal of friendly countries upon completing Squadrons re-equipment with Tigers. Ethiopia obtained 4 F-5A in 1974, Greece 12 F-5A in 1975, Jordan 30 F-5A and 6 F-5B in two batches starting from late 1974, Morocco 4 F-5A. Some were kept for later Iranian use, ex 12th TFS being stored at Tehran-Mehrabad. Even the USA requested them in order to supply 10 to Kenya during 1975, but the deal fell through as the aircrafts were already committed to Jordan. The opposite way came Pakistani Shenyang F-6s from the 19th Squadron to Vahdati AB in September 1978 for an Iran-Pakistan armament competition. Iranian F-5s, together with Phantoms, operated during the two-days exercise Midlink77 against US Navy Phantoms of the aircraft carrier USS Midway. The only known war operation took place in 1976 when more than 100 Northrop F-5E/F-5F in two missions over Afghanist in a tentative to renstall the Afghan king, ousted by a coup. Note that first digit of Wings and Squadrons number corresponds to Air Base number. Squadron patches can be found on Imperial Iranian AF site. 1971. A crash left the team operating only with 5 aircrafts from 1972 till 1975.
to 8 in 1977 and 1978, after which the team was disbanded due to change of government. Exact type of lost aircrafts during the years 1974, 1975 and 1976 (each 1 aircraft) and 3 lost in 1978 is not known, but some might be Northrop F-5E. See ejection-history.org.uk site for details. Early thougts about an Tiger replacement ended in an order for 160 General Dynamics F-16s placed in 1976 and financial contribution to the development of the F-18. The USA wshed that the General Dynamics F-16 would replace Northrop F-5s on a one-to-one basis. Political unrest began at the end of October 1978. Northrop started to withdraw its employees and relatives from November 1978. Unconfirmed are reports about sabotage to electrical wiring harnesses inside approximately 20 F-5s during this time. Shah Reza Palevi left the country on 16-01-79 and the remaining Imperial government fell on 12-02-79, giving way to the establishment of the Islamic Republic of Iran.